We are now making our epic roasts every Sunday!! It’s really popular so it’s a good idea to book. Like now, do it. All come with seasonal veg, duck fat potatoes, Yorkshire pudding and gravy. Everything on the menu just half the price and half the size. We also have ice cream. Our signature dishes, only smaller. With plenty to go round. Buttermilk fried chicken breast burger with our hot sauce. Truffled mac and cheese patty. Our epic whiskey and ginger wings. Tray of Nachos, made with our salsa and legendary beer cheese sauce. For the price you will receive 12 bigger than bite-sized sliders, a basket of wings, fries and a tray of nachos. Enough food for 10 hungry people or 12 not so hungry. We stock over 40 different spirits premium and standard. If there is anything you are particularly fond of please send us an email, we can let you know if we have it in stock or give you a great alternative. We have a great range of beers and ciders on tap and in the fridge. A selection of craft and world beers including breweries such as Signature Brew, East London Brewery, Hackney Brewery, Truman’s Beer, Three Sods Brewery, Mondo Brewing Company & Beaver Town to name a few. Jose Cuervo Tradicional, Cointreau, lime. Shaken & served up, garnished with a salt rim. Tiki twist on a Daiquiri (not very sweet at all). Malibu, lime, sugar. Shaken & served up. Garnished with a lime wheel. The original party drink. It’s tacky and we love it! Absolut Vanilla, passion fruit, apple. Shaken, served up with a shot of bubbles on the side. Festive & fab. Plymouth Sloe Gin, lemon, sugar, egg white, (optional). Shaken & served up. Garnished with 3 juniper berries. Classic as they come. Beefeater, lemon, sugar, Crème du Mure. A slightly warmer, slightly boozier twist on a Negroni. Chivas Regal, Mancino Vermouth, Suze. Stirred down & served short, over ice. Garnished with an orange twist. Each Thursday get two cocktails for the price of one with your star loyalty card. Not got one? Ask at the bar! 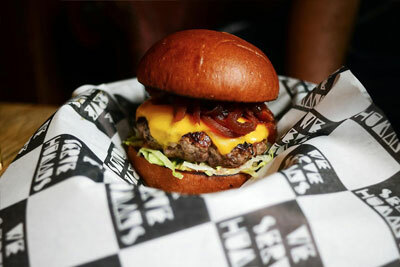 Their only objective is to make you happy with totally awesome burgers and other naughty food. A group of chefs that know what makes food good, putting this knowledge and skill into making the best burger! Travelled far and wide and eaten THOUSANDS of burgers in their quest to find the ultimate double bread with meat, research led them to create “The Chairman”, Brisket and short rib patty, with added marrow for juice. Try it for yourself. Choose either The Chairman or Mac the Ripper. To view our allergen sheet please email [email protected] or ask at the pub. All our food is freshly prepared on the premises and we handle all allergens in our kitchen. Although we take preventative measures to stop cross-contamination, we can’t guarantee our dishes will be 100% allergen free.